Scott Sommerdorf | The Salt Lake Tribune The Pleasant Grove bench jumps up to celebrate a three point shot during second half play. Pleasant Grove defeated Copper Hills 57-42, in a boy's 6A semi-final, FrIday, March. 2, 2018. Scott Sommerdorf | The Salt Lake Tribune Pleasant Grove's Matthew Van Komen passes past Copper Hills' Trevon Allfrey during first half play. Pleasant Grove defeated Copper Hills 57-42, in a boy's 6A semi-final, FrIday, March. 2, 2018. Scott Sommerdorf | The Salt Lake Tribune Viking Casey Brown goes up for an easy layup during first half play. Pleasant Grove defeated Copper Hills 57-42, in a boy's 6A semi-final, FrIday, March. 2, 2018. Scott Sommerdorf | The Salt Lake Tribune Pleasant Grove's Kawika Akina drives during first half play. Pleasant Grove defeated Copper Hills 57-42, in a boy's 6A semi-final, FrIday, March. 2, 2018. Scott Sommerdorf | The Salt Lake Tribune Copper Hills' Kylan Shorts drives during second half play. Pleasant Grove defeated Copper Hills 57-42, in a boy's 6A semi-final, FrIday, March. 2, 2018. Scott Sommerdorf | The Salt Lake Tribune Pleasant Grve's Kawika Akina, left and Matthew Van Komen are a study in contrasts in height. Pleasant Grove defeated Copper Hills 57-42, in a boy's 6A semi-final, FrIday, March. 2, 2018. Scott Sommerdorf | The Salt Lake Tribune Copper Hills' Kylan Shorts drives during second half play. Pleasant Grove defeated Copper Hills 57-42, in a boy's 6A semi-final, FrIday, March. 2, 2018. Scott Sommerdorf | The Salt Lake Tribune Pleasant Grove center Matthew Van Komen follows the flight of his shot during first half play. Pleasant Grove defeated Copper Hills 57-42, in a boy's 6A semi-final, FrIday, March. 2, 2018. Scott Sommerdorf | The Salt Lake Tribune Copper Hills' Tevon Allfrey shoots during second half play. Pleasant Grove defeated Copper Hills 57-42, in a boy's 6A semi-final, FrIday, March. 2, 2018. Scott Sommerdorf | The Salt Lake Tribune Copper Hills head coach Andrew Blanchard talks with his team during a first half time out. Pleasant Grove defeated Copper Hills 57-42, in a boy's 6A semi-final, FrIday, March. 2, 2018. Scott Sommerdorf | The Salt Lake Tribune Pleasant Grove's Kale Mikkelsen hovers over Copper Hills' Trevon Allfrey during second half play. Pleasant Grove defeated Copper Hills 57-42, in a boy's 6A semi-final, FrIday, March. 2, 2018. Scott Sommerdorf | The Salt Lake Tribune Viking guard Kawkia Akina drives during second half play. Pleasant Grove defeated Copper Hills 57-42, in a boy's 6A semi-final, FrIday, March. 2, 2018. Scott Sommerdorf | The Salt Lake Tribune Copper Hills head coach Andrew Blanchard look over the action during second half play. Pleasant Grove defeated Copper Hills 57-42, in a boy's 6A semi-final, FrIday, March. 2, 2018. Scott Sommerdorf | The Salt Lake Tribune Team mates take care of Jacob Jensen after he was taken out of the game when it was clear the Grizzlies were going to lose. Pleasant Grove defeated Copper Hills 57-42, in a boy's 6A semi-final, FrIday, March. 2, 2018. It started with a text message. 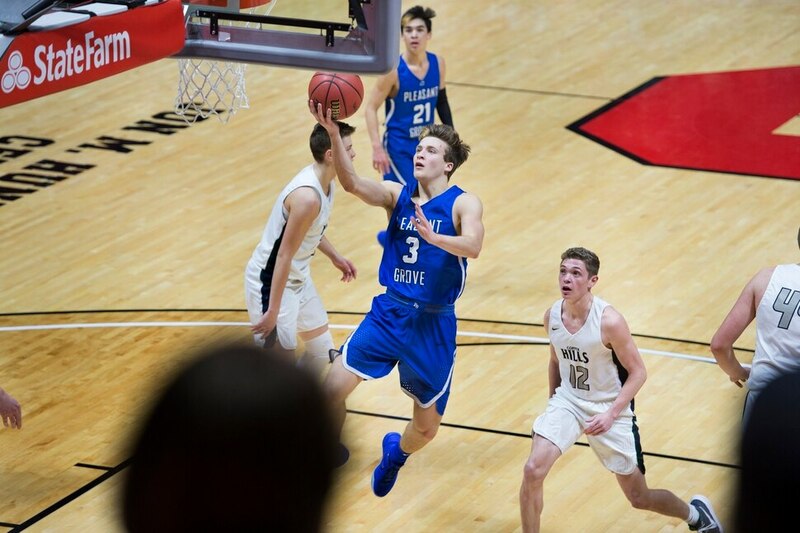 “Can I work out tomorrow?” Pleasant Grove center Matt Van Komen texted his coaches after last year’s state semifinal loss to Bingham. The coaches had planned to give their players a week off, but they said yes. “Sure enough, 20 people were in the weight room the next day because of Matt,” Pleasant Grove coach Randy McAllister said. 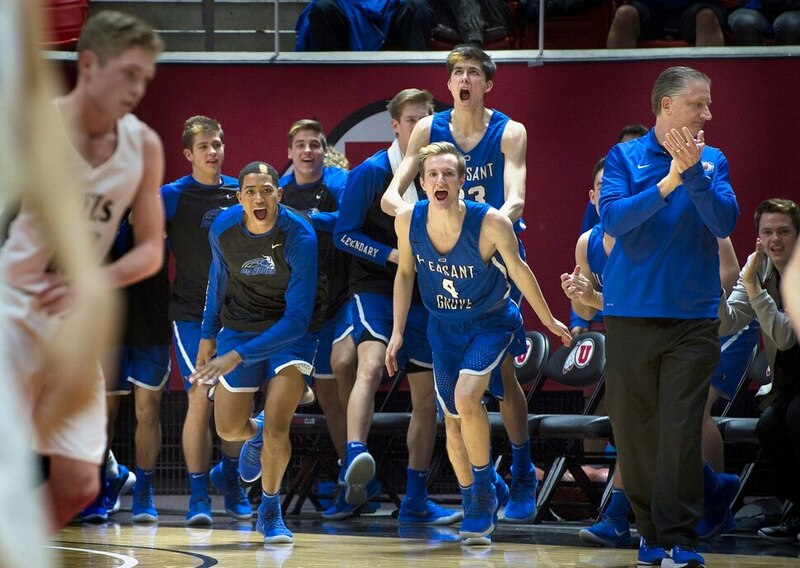 With the drive to move past the disappointment of coming up short in the state semifinal and led by the players who were there for that let down, Pleasant Grove came full circle with a 57-42 win over Copper Hills in the Class 6A boys’ basketball state semifinals Friday at the Huntsman Center. 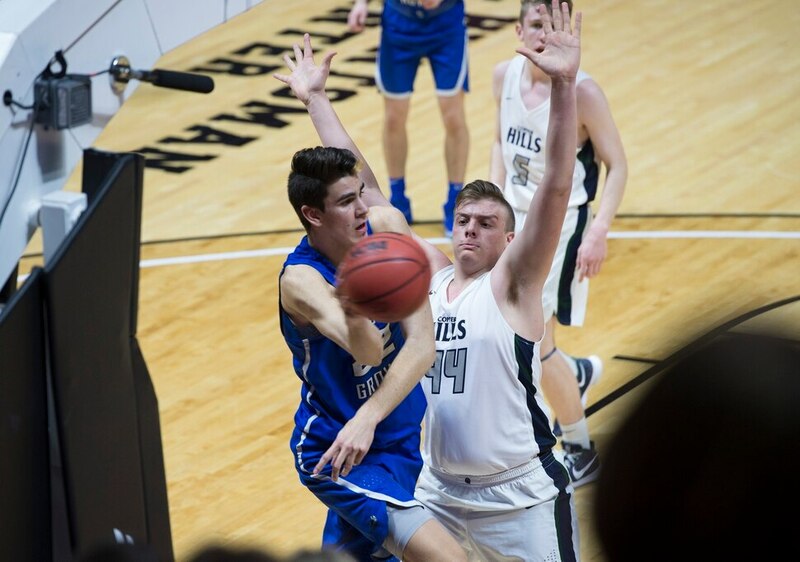 Copper Hills was given the unpleasant task of trying to defend a team that sports a roster with both perimeter shooters, guys who can drive to the basket and a 7-foot-3 post player in Van Komen. Van Komen scored 17 points, 12 of which in the first half, while Brown, Kael Mikkelsen and Tyler Fairbanks combined for five 3-pointers. Copper Hills threatened to make a comeback at the end of the third quarter as Trevon Allfrey hit back-to-back 3s and Jacob Jenson followed with trey of his own to bring the Grizzlies within six points. As they had after last year’s state semifinals loss, the team leaders stepped in. They broke from the huddle motivated. Then came their chance to send a message. Mikkelsen dived after a loose ball and threw it to Brown, who scored the layup. On Pleasant Grove’s next possession, Fairbanks hit a lofting shot from beyond the arc. The Vikings continued to build on their lead from there to earn a spot in Saturday’s title game. • Pleasant Grove earns a berth in the inaugural Class 6A state title game. • Casey Brown leads the Vikings with 25 points and three assists. • Copper Hills forward Trevon Allfrey scores a team-high 15 points and drains three 3-pointers in the second half.